Many people are now using sound to help them relax and numb the internal noise built up over the day. Regularly replacing pings and bells for more soothing sounds is what our bodies need to stay balanced and calm. The term “sounds of silence” may appear to be an oxymoron. How can silence have a sound? The premise here is to replace the various and constant irritating sounds that surround us, with more soothing ones. Many will agree that our lives have become much louder with the advancement of technology and therefore more stressful. Everything happens quicker and perhaps, easier due to these advancements, but we need balance. The human body has a limit to how much external noise it can absorb before it begins to show symptoms from stress and anxiety. There is a treasure trove of “sound therapies” that are proven to relieve many types of anxieties both in the short term and long term. The ultimate goal is to regularly take time to disconnect from the day long “noise” that constantly pulls at our energies and irritates our nervous system. We will examine a few techniques and practices people are using to overcome anxiety, stress and pain. White noise can be described as a constant sound like the spinning of a fan, the rumble of a jet engine or the sound of trickling water. When we have trouble sleeping because there is noise in our environment such as traffic or construction work, or for many of us constant ringing in the ear, using white noise will help us focus on that sound instead. Because white noise is a balanced and a constant sound with no highs or lows, such as a fan, the sound is soothing. Nature sounds, like white noise, can also be balanced and constant as a spinning fan. We can select from various sounds like birds, purring cats, rain or beating hearts. For nature-lovers who don’t get out much, the sounds of nature on a CD or sound machine can be relaxing and as well as meditative. Singing bowls are ceremonial brass or crystal bowls designed specifically to create a note from the musical scale when struck and sustain it for several seconds to minutes. Many people claim that they are therapeutic and attend concerts held in spiritual or healing centres to help relieve stress. 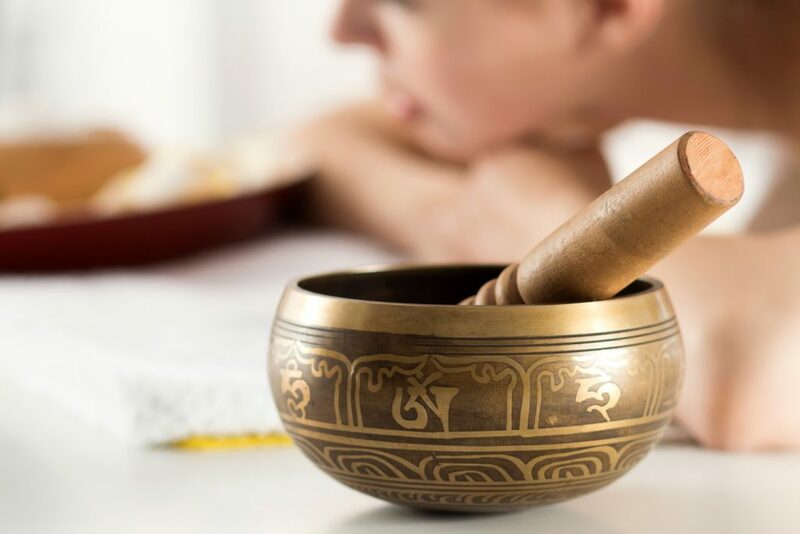 Studies show that the sounds emanating from the bowls can match the natural vibration of healthy cells in our bodies thus creating a balance in the physical body while relaxing the mind. Chanting is an ancient technique to bring the body to a relaxed and meditative state while elevating the natural healing abilities in the body. When we chant certain sounds, our bodies will gently vibrate releasing calming hormones, as well as help us focus. When we are in the presence of a practitioner chanting specific sounds, we are more passive and allow the sounds to melt away stress. Readily and easily accessible, these sounds are available on CDs, on sound machines and on apps we can download to our phones. Tune in so that you can tune out! To learn more about the benefits of sound, you can also read this interesting article Everything You Need to Know About Sound Healing.